The time: Dusk, 19 December 1798. 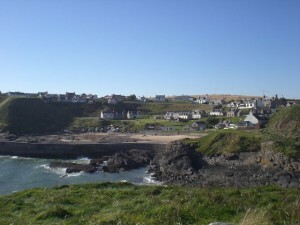 The place: Collieston, a tiny fishing village on the North East coast of Scotland. The previous evening, the lugger Crooked Mary had landed her cargo of contraband. Now, under cover of darkness, the fisherwomen of Collieston put their creels to good use and began the trek to Ward, laden with gin. At Ward lived Philip Kennedy and his brother John. The Kennedys had heard that information about the night’s operations had been passed to the excisemen. Knowing that a gauger called Anderson – a thorn in the flesh of the free-trading fraternity – was in the area with two colleagues, and had recently intercepted a consignment of gin at nearby Sandend, the brothers set out to warn the approaching party. Anderson and his companions had hidden themselves at a place about a quarter of a mile north of the Kirk of Slains, knowing that the smuggling party would take that route. Philip and John Kennedy arrived just as the gaugers leapt out to confront the procession. Philip was a strong and powerful man and, despite opposing the excisemen’s cutlasses with only a cudgel, he succeeded in holding down Anderson’s two companions. He called on his brother to hold Anderson, but the gauger’s sword was too much for John. Anderson’s blade struck through John Kennedy’s bonnet and gashed his head, blinding him with blood. Anderson turned then to Philip, threatening to cut off his head if he did not release the two gaugers. Philip held on, ignoring the exciseman, calling to his comrades for help. Unknown to him, however, the rest of the entourage had fled into the night. Anderson rained several blows of his sword on the head of Philip Kennedy, before he released his hold. Giving him up for dead, the gaugers turned their attention to the booty. With his head split open, Philip Kennedy dragged himself off into the night, and incredibly covered three quarters of a mile to the farm of Kirkton. Collapsing in the farm kitchen, he criticised his colleagues with his dying breath. Anderson was tried for murder before the High Court, but was acquitted as having killed Kennedy in self-defence, and in the discharge of his duty. Decr. 1798 Aged 38 years. And if you are lucky enough, as I was, to meet one of the old parishioners on your visit, you may hear of the many occasions when the skull of Philip Kennedy – easily identifiable by the cleft of the gauger’s blade – has been turned up during the excavation of adjacent resting places. The spirit of Anderson must live on, for it seems there is no rest even yet for this smuggling hero of Slains. This entry was posted	on Friday 11 May 2001 at 09:32	and is filed under Clark's Caledonia. You can follow any responses to this entry through the RSS 2.0 feed. You can leave a response, or trackback from your own site.